A photo of Rev. Richard Hillstrom, taken at Thrivent Financial by Stan Waldhauser ’71. Hillstrom majored in English and history at Gustavus and went on to graduate from Augustana Seminary in Rock Island, Ill., in 1942. 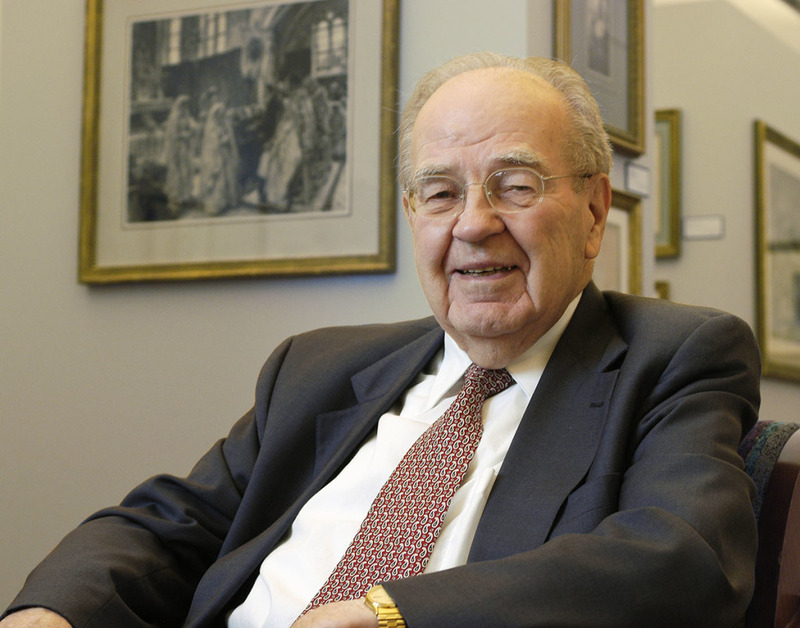 He took a pastoral position in Gary, Ind., and worked there for five years before returning to Minnesota in 1947 to accept a position at Mount Olivet Lutheran Church in Minneapolis. Hillstrom spent a majority of his pastoral career—a 30-year stint—as the chaplain at Bethesda Hospital in St. Paul before retiring in 1982. Upon retiring from ministry, Hillstrom turned to his other passion: art. He became the art acquisitions curator at Lutheran Brotherhood (now Thrivent Financial) in Minneapolis and went on compile a large religious art collection that at one time was named by Art & Auction magazine as one of the best 101 corporate art collections in America. Hillstrom also had a large personal collection of art and over the years donated more than 250 paintings, drawings, and prints that make up the permanent collection of the Hillstrom Museum of Art. In addition to donating many works of art, Hillstrom also made significant monetary donations to create an endowment for the Museum, providing funds that allow the Museum to acquire additional artworks. In May of 2012, Hillstrom received the College’s Sesquicentennial Award in recognition of his support for the Hillstrom Museum of Art. A funeral service for Hillstrom will be held at 2 p.m. Saturday, Dec. 20 at Mount Olivet Lutheran Church. More details will be posted as they become available.